A 12-year-old boy named Dan Bashin is taken to the alternate world of Grand Rolo by two mysterious siblings, Yuuki and Kajitsu Momose. There, he learns that he's one of the chosen core soldiers, bearing the light of the red core. Along with the other soldiers, he must save Grand Rolo from Otherworld King, who has been exploiting the worlds natives. The story is of bashin dan where he is taken to the "otherworld" a different world of earth. Along with 5 others, where they are core soldiers with a color-soldier, where they are the ones who can become the king if they win against the otherworld king, or in short the chosen ones. The battle system- when a character takes damage you get hurt with pain. The battle is super easy to understand it's always explained. Draw step, core step, refresh step, main step all of that, probably forgot one. Just follow along and you will not have any problem, like how did he beat that. Cgi better- than past, I watched 480p choppy on youtube and could tell real video source would be way better, I couldn't find it anywhere else, you probably will have better chance. "otherworld" is a place where everything is decided by battle spirits. That rule was set by the "otherworld" king and everyone from the "otherworld" will abide. Dan will meet magisa a witch where her powers were taken by the king and has washed up magic. Art- is very good, watched on youtube where I could only find it and was bad, choppy. That is how I know it is good if found somewhere else at hd. Sound- The op is good, ost is very good and at scenes the soundtrack is amazing at the best moments. Battle ost very good or like key cards ost goooood. character- There all amazing, dan main red, gets better as the story goes on. Enjoyment- Very good, better than prequel standalone. There is slight humor and little hints of romance between two certain mains. This story starts with Bashin Dan who was taken into another world by siblings Kajitsu and Yuki, after dan pursues Kajitsu when she defeated him. At first it does seem ordinary and confusing. This confusion persists only for the first episode as the scene of Dan defeated by Kajitsu was shown at the beginning of the episode. I did not get to understand when and how these two siblings come across with Dan. I was in a dilemma that it may be a prelogue to the content of the episode. It seems as if the scene is fastforwarded. But from Episode 2 it captured my interest and till the end of the series it is too good. Kajitsu calls Dan as red soldier and in subsequent episodes there will come 5 more soldiers who came from Earth like him to Grand Rolo. All of the 6 soldiers (including Yuki) had to win over otherworld king who abuses his power by torturing the otherworld original people. Art: It is good. 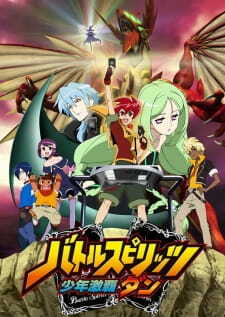 But at the same time this anime series is not available in good quality in online. It's video quality degrades by the end of the series. But story development made it possible to adjust with this. One of the amazing thing of the series is that the spirits and their fighting is shown fiercely. None can take their eyes from the heated battles. Graphics were used well to make it touching and emotional intensity. Music : First Opening song is good and also while battle seems to be intensely in favor of our hero, then the background music is superb. I got immersed with our hero group fighting style. Characters: It is the only anime for which i can not pinpoint one character as good or more positive than others. Every character is shown sympathetic in their own way. For example, Leon is one of the three heads under other-world king, whom one thinks as overambitious. But when it is shown that his desire to have power is to overcome the low status which he experienced in his own era, one can understand how a person's economic status affects the course of action he takes. Every character in the series is needed. Anyone have the english subtittle in format .srt or .ssa?